We have developed some nutritious baby friendly soup recipes for you, to help introduce little one to new flavours and textures. “Sometimes it can be a challenge to encourage children to ‘eat their greens’. That’s why it’s best to start offering vegetables, including plenty of green veggies, when they are first introduced to solid foods. 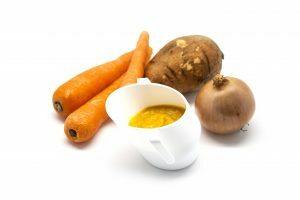 Vegetables are not only packed with vitamins and minerals, but also contain lots of different flavour profiles such as bitter and sour tastes to help expand baby’s palate from day one. It’s also a good idea to look at different and interesting ways to serve vegetables that will appeal to infants. A great idea, especially in the cold winter months, is to pack plenty of veggies into soups and offer these to your little ones on a regular basis. Soups are great as they are easy and inexpensive to make, can include pretty much any vegetables and children tend to enjoy them too.” Comments Charlotte Stirling-Reed Registered Nutrition Consultant specialising in maternal, infant and childhood nutrition. • Sweet potatoes are high in beta carotene (vitamin A) plus they contain vitamin C, calcium and iron. • Carrots are an excellent source of beta carotene which is converted to vitamin A in our bodies. Carrots also provide vitamin K which helps in the maintenance of normal bones and contribute to normal blood clotting. *NB: Cows’ milk can be used in cooking from 6 months of age. These soups can be thinned or bulked out with extra veggies to make it the right texture for your baby. Adding milk and yogurt to get the consistency (and temperature) right can really help too and this also boosts the soups’ nutrient content at the same time. 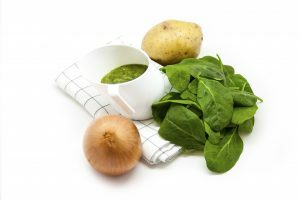 • Spinach contains small amounts of iron but is also packed with other nutrients such as calcium, folate, vitamin K and beta carotene. Many of these are important for the functioning of the immune system. • If you add natural yoghurt or milk this recipe will also be a good source of protein and calcium for healthy bones and teeth. • NB: Cows’ milk can be used in cooking from 6 months of age.